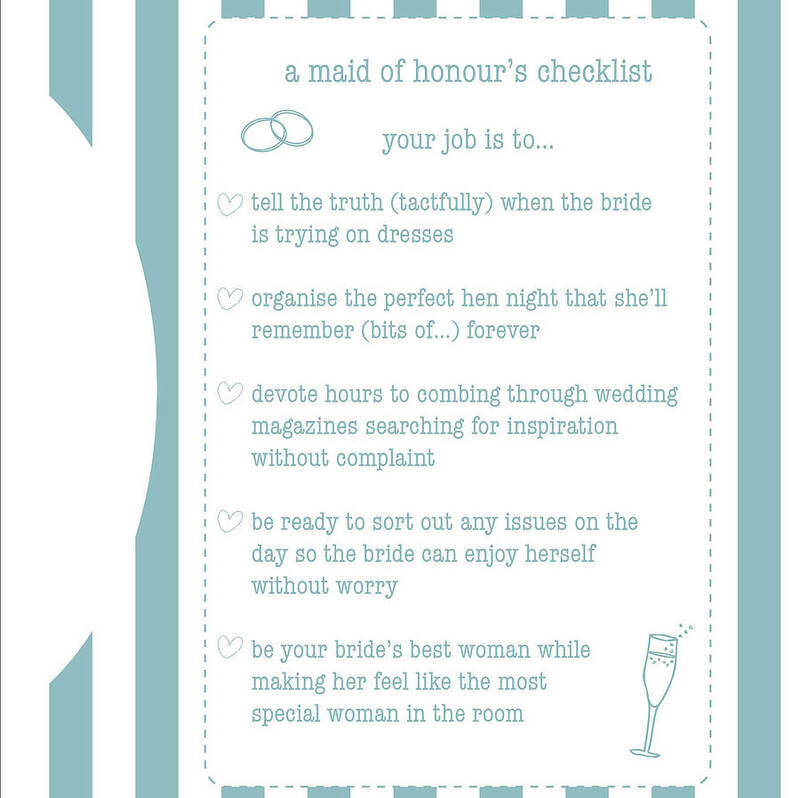 Make your maid of honour feel part of the big day's plans with her own wedding planning notebook. 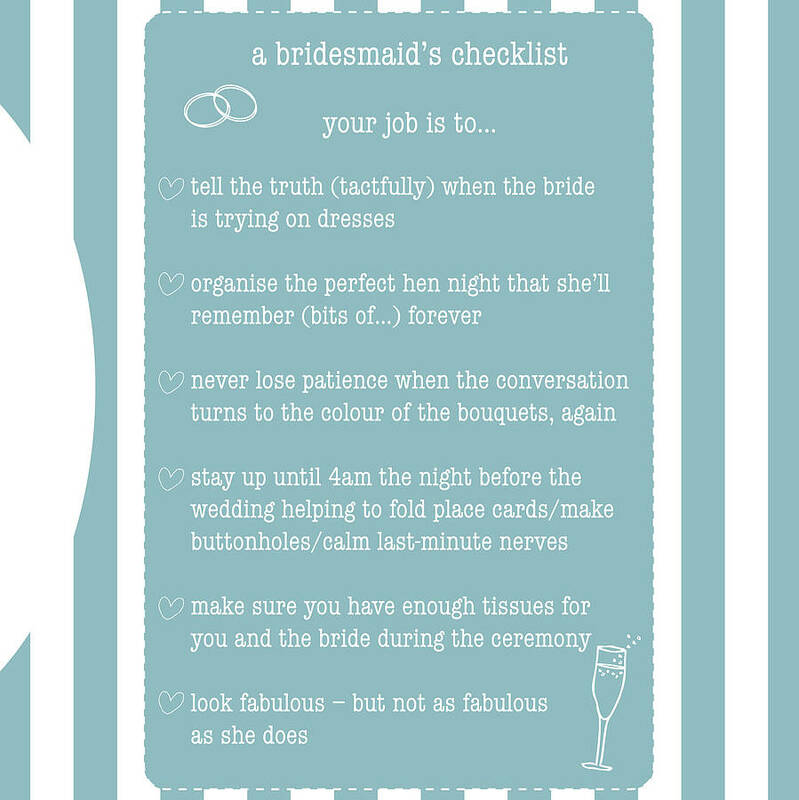 The maid of honour has a lot of responsibilities, not least planning the bride's hen party! 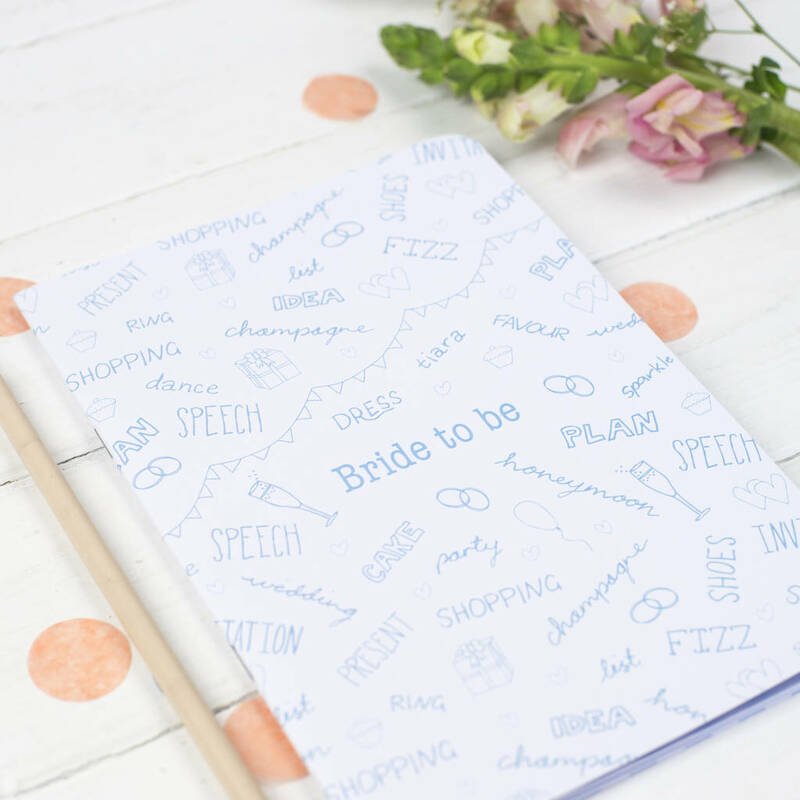 So a dedicated notebook is ideal for jotting ideas and plans as well as helping the bride with the big day's plans. 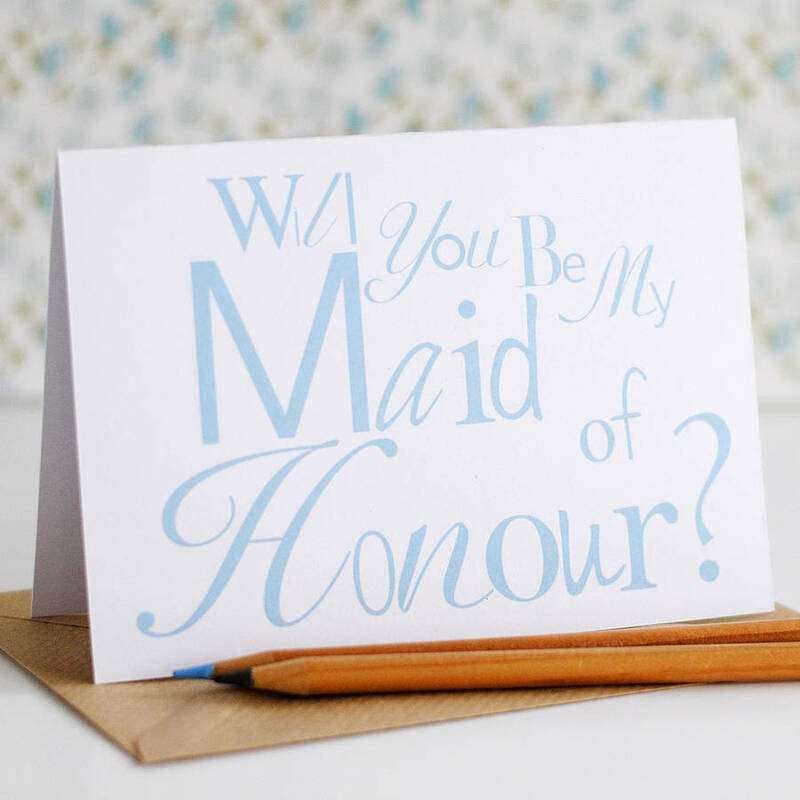 Order a 'Will you be my maid of honour?' 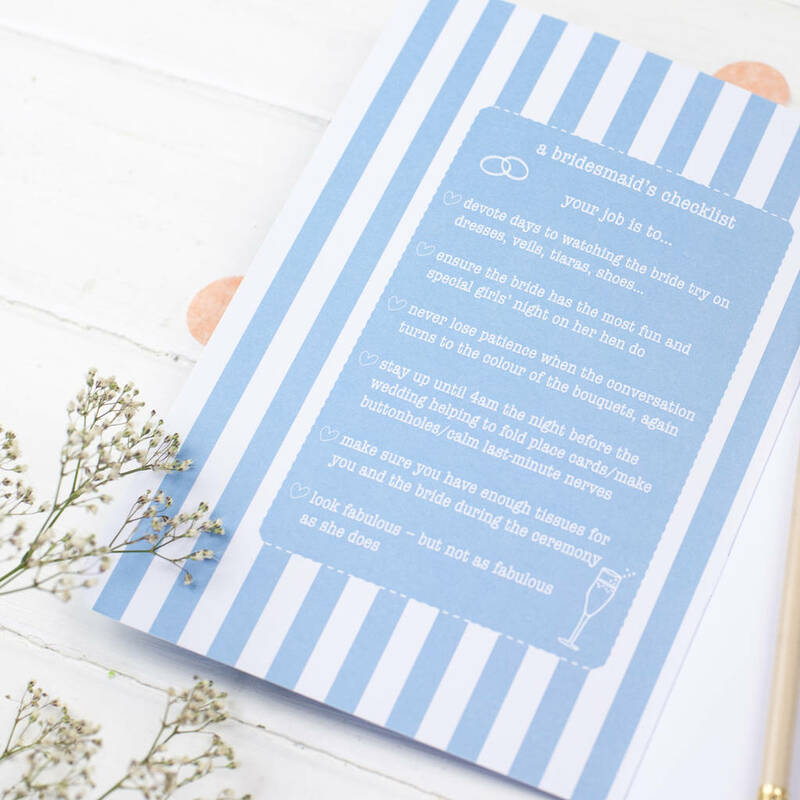 card to give with the notebook to ask your maid of honour to take on the role in style! 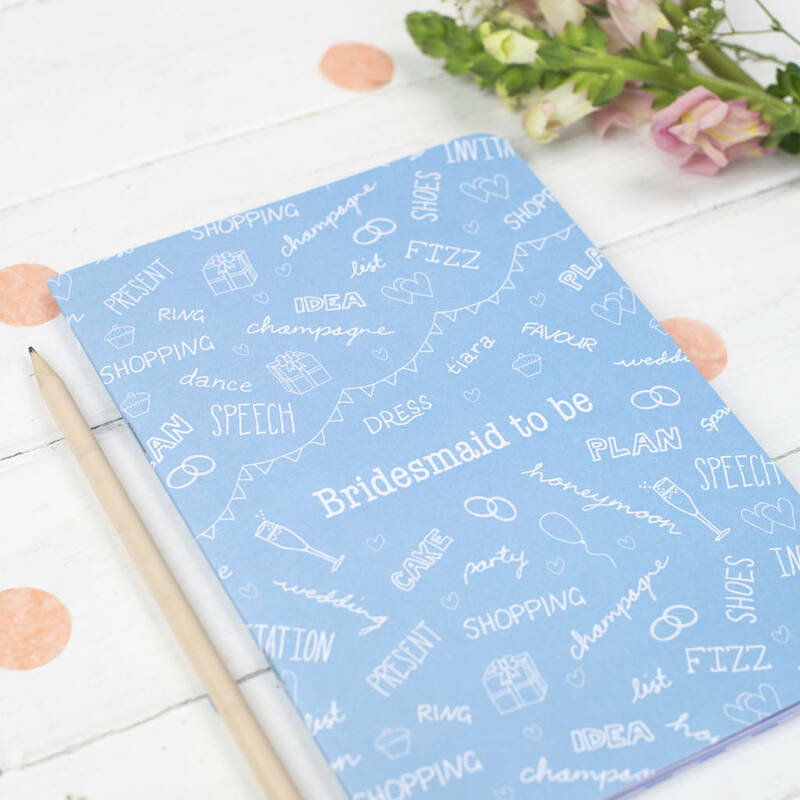 There are also notebooks for the Bride, Bridesmaid, Mothers of the bride and groom, Best man, Bridegroom and Flower girl available. 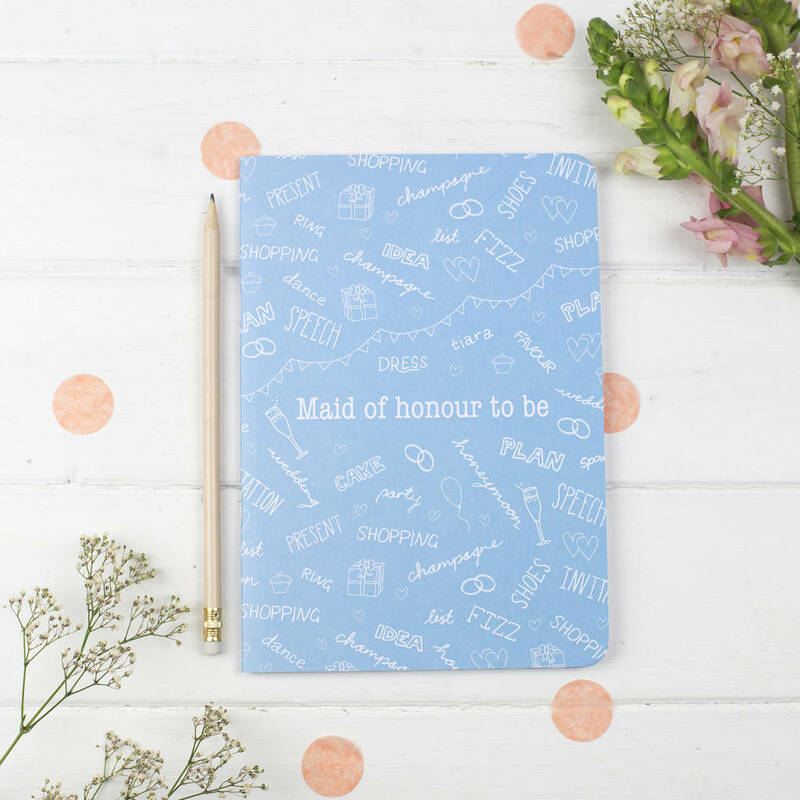 The Maid of honour notebook is a generous A5 in size with a pretty pattern of hand drawn illustrations and lettering, perfect for jotting down every wedding detail. 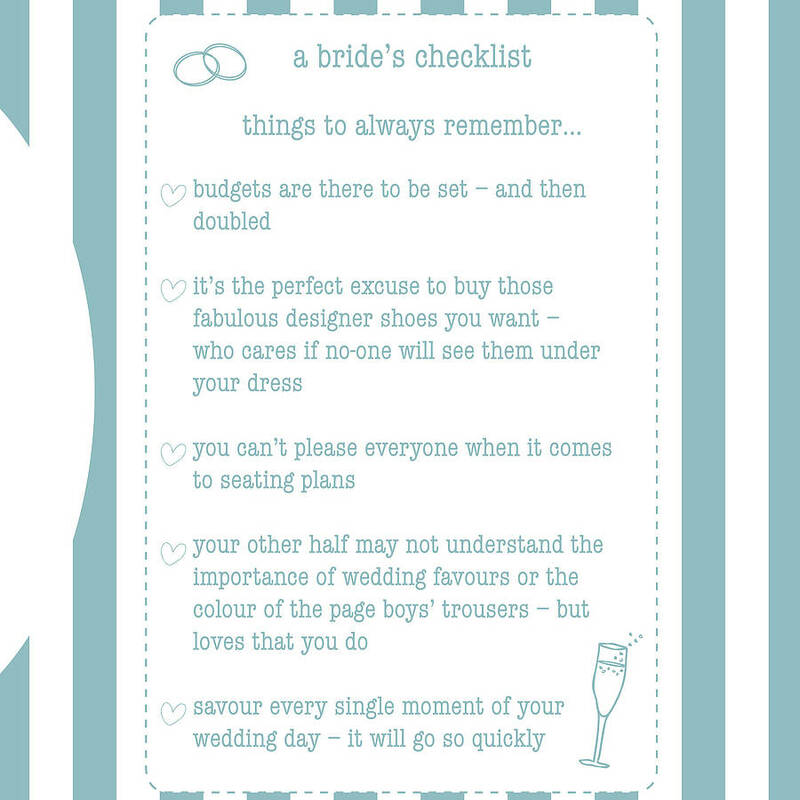 The stripy inside covers feature top tips for every maid of honour to be. You can choose a Maid of honour notebook and add extra notebooks for the Bride and Bridesmaid too so everyone can have their own notebook for planning and plotting! Inside each A5 notebook are 40 pages of white, recycled, plain paper. 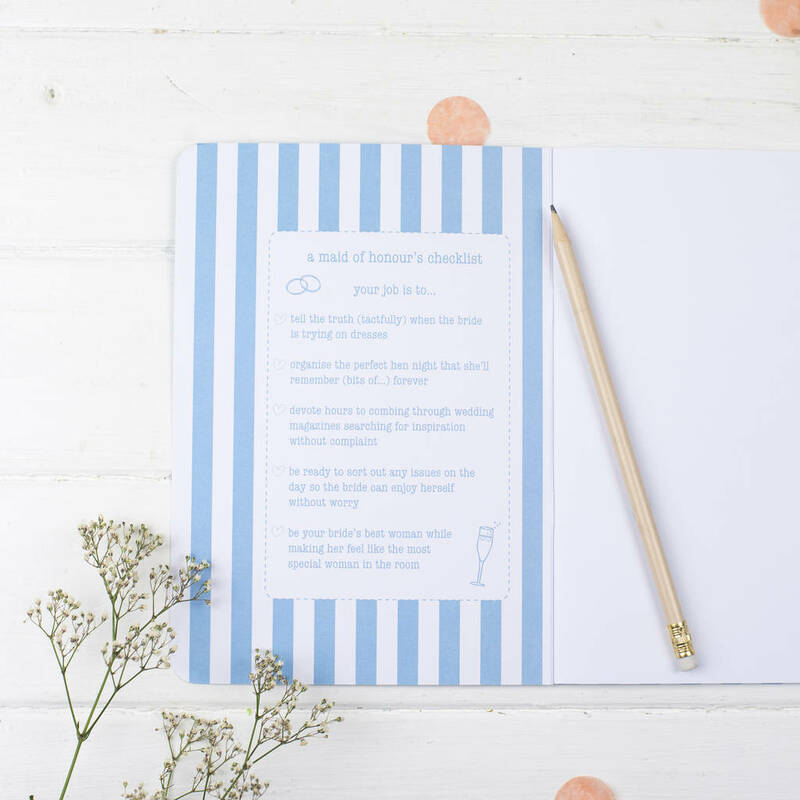 The notebook has a thick recycled paper cover featuring a blue and white pattern of hand drawn illustrations and words on the front and back. 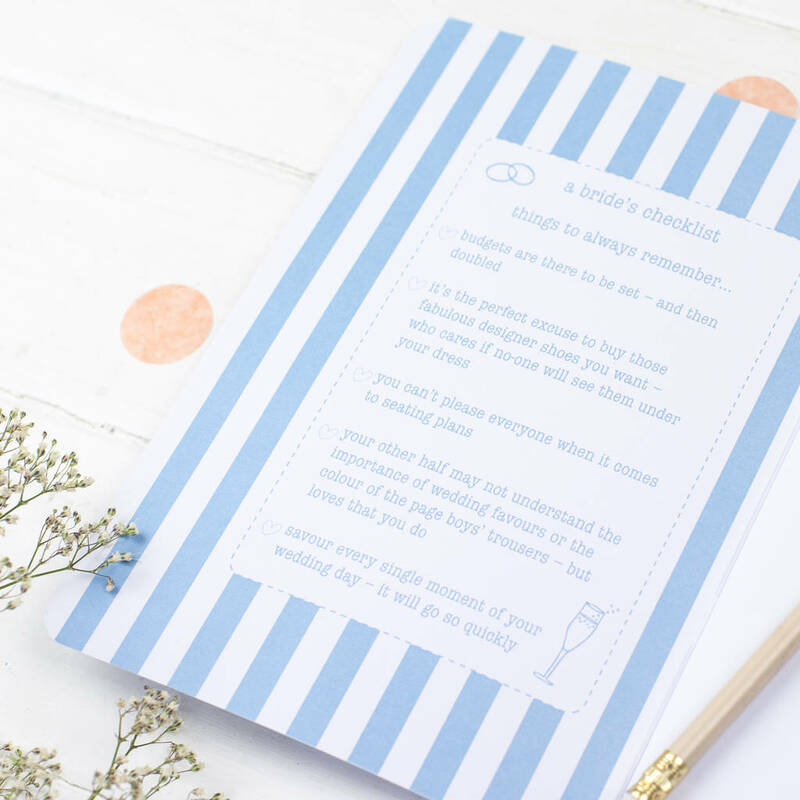 The corners have been rounded, and the inside cover features a matching stripy design for that extra special touch. All the green gables recycled stationery is designed and printed in the UK. These notebooks will reach you in perfect condition wrapped in recycled tissue paper inside a padded envelope. The A5 notebook measures approx 14.5cm x 21cm.